Build on What You Know In the previous lesson you learned about the kingdom of Kush. South of Kush, a new African kingdom arose as a leading center of political and economic power. 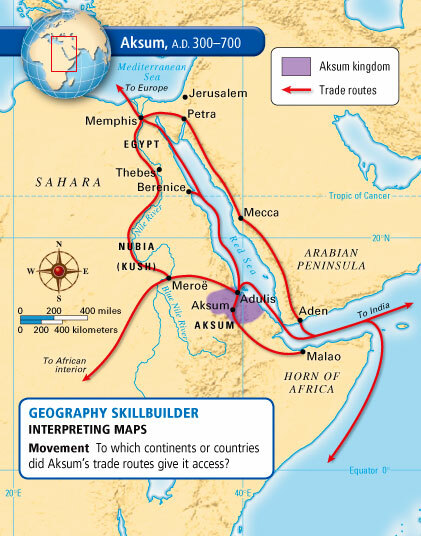 ESSENTIAL QUESTION Why did trade become important to Aksum? The kingdom of Kush fell when Meroë was destroyed by a king of Aksum (AHK•SOOM). Kush was conquered by Aksum. Aksum was located in modern-day Ethiopia and Eritrea. Perfect Trade Location Aksum arose in the Horn of Africa, an area shaped like a rhinoceros horn. (See map below.) This location gave Aksum access to trade to the Red Sea, Mediterranean Sea, Indian Ocean, and the Nile valley. Arab traders built colonies and trading posts there. They found the location ideal for exchanging goods from the Indian Ocean trade, Persia, and Africa. Aksum was a meeting place for African, Arabian, and other peoples. A legend traces the founding of the Ethiopian dynasty of Aksum to Menelik, son of King Solomon of Israel and the Queen of Sheba. An International Trading Hub Like Kush, Aksum became a trading hub, or center, from which trade spread out in many directions. Traders came from Egypt, other parts of Africa, Arabia, the eastern Mediterranean, Persia, and India. Adulis (ah•DOO•lihs), a city on the Red Sea, was the main trading port of Aksum. There traders exchanged salt, ivory, cloth, brass, iron, gold, glass, olive oil, and wine. Animal traders purchased animals such as giraffes and elephants. ESSENTIAL QUESTION What was the effect of King Ezana on religion? At the beginning, Aksum was small. Then, in the A.D. 300s, a bold king added territory and built a powerful nation. Trading Nation A Ezana (AY•zah•nah) was a strong king who rose to power in Aksum in A.D. 325. First he took control of a trading colony on the coast of the Arabian peninsula. Then, in 350, he conquered Kush and burned Meroë to the ground. Around this time, the empire of Aksum expanded inland and along the coast of the Red Sea. As a result, the kingdom controlled a large trading network. Ezana had become king as an infant. While he was being educated, Ezana's mother ruled on his behalf. One of Ezana's teachers taught him about Christianity. When Ezana began to rule he converted to Christianity. He also made Christianity the official religion of Aksum. The Christian church in Aksum was linked to Alexandria, in Egypt, rather than to Rome. Background: African rulers in Egypt, Kush, and Aksum had accounts of their military campaigns carved onto stone pillars and thrones. They followed a standard format. First they described the reasons for going to war. Then they described the war itself. Next they noted the campaign's results. Finally, they gave thanks to the gods or God for victory. The passage quoted on the right was carved onto a throne for King Ezana to celebrate his victory. Aksum Crown - This is an early crown from the Christian kingdom of Aksum. doing any injustice to my peoples. ESSENTIAL QUESTION What were some of Aksum's achievements? A unique culture rose in Aksum. Just as the people of Kush blended Nubian and Egyptian influences, so Aksum saw a coming together of cultural influences from the Horn of Africa and southern Arabia. Architecture Among the most impressive of these achievements were the pillars of Aksum, which builders placed around the country. Some were 60 to more than 100 feet tall. Writing carved on the pillars celebrated great victories or achievements. Builders in Egypt and Kush had used pillars in a similar fashion. Builders constructed Aksum's tall pillars without mortar. They were carved from single stone slabs. Features included false doors and windows. Builders and architects also built large temples. Later, richly decorated Christian churches replaced the temples. A Written Language Aksum had a written language called Ge'ez (gee•EHZ). Arabian migrants brought the language to Aksum. Ge'ez became the basis for three languages that are used in Ethiopia and Eritrea today—Amharic, Tigrinya, and Tigre. Ge'ez is still used in the Ethiopian Church. Terraced Farming The landscape of Aksum was rugged and hilly. To adapt the land for farming, farmers built terraces. A terrace is a leveled-off area of land. Being flat, terraces hold moisture better than hilly land does. Terraced farming increased the amount of land that could be cultivated. Aksum's farmers also built canals, dams, and holding ponds to bring mountain water to the fields. • Aksum became a powerful trading center. • King Ezana expanded Aksum's empire. • Aksum's unique culture had long-lasting effects. Many Ethiopians today are Christians, the religion of King Ezana.